See Max, Siva, Jay, Tom and Nathan 'Chasing The Sun' at Wembley Stadium during the Summertime Ball 2012. 1. The Wanted light up the stage at the start of their Summertime Ball 2012 set. 2. Tom from The Wanted wears a leather jacket for the band's Summertime Ball set. 3. Max has a smile for The Wanted's fans at the Summertime Ball 2012. 4. The Wanted wowed fans at Wembley Stadium with their set. 5. The Wanted performed hits including 'Glad You Came' and 'All Time Low'. 6. The Wanted opened their set with debut single 'All Time Low'. 7. The Wanted also performed recent hits 'Lightning' and 'Chasing The Sun'. 8. Siva from The Wanted orders fans to put their hands in the air. 9. The Wanted's Nathan appears on stage at Wembley Stadium. 10. 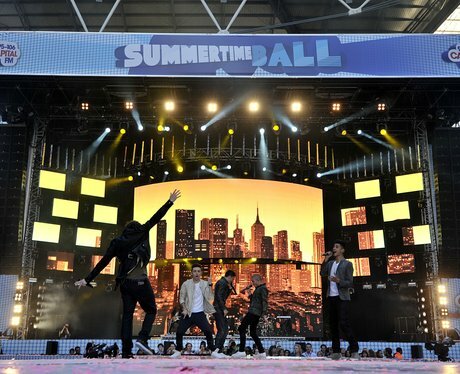 Max, Siva, Nathan, Tom and Jay gave a rousing performance at the Summertime Ball 2012. 11. Siva from The Wanted on stage at the Summertime Ball 2012 at Wembley Stadium. 12. Max from The Wanted enjoys his moment on stage at Wembley Stadium. 13. The Wanted appear on stage at Wembley Stadium. 14. The Wanted live at the Summertime Ball 2012. 15. The Wanted told fans that they've missed Britain during their recent US tour. 16. Jay from The Wanted appears on stage at the Summertime Ball 2012. 17. The Wanted live at the Summertime Ball 2012. 18. The Wanted live at the Summertime Ball 2012.